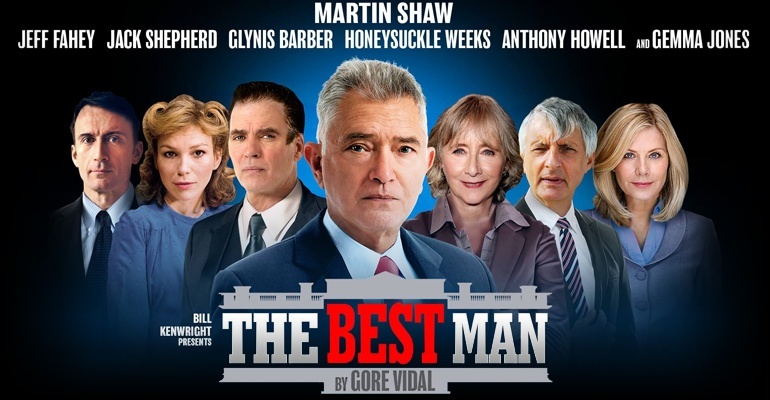 "Shaw does a very solid job"
Martin Shaw stars in the West End premiere of Gore Vidal’s thrilling political drama The Best Man, playing a strictly limited engagement at the Playhouse Theatre. Directed by Simon Evans, the play follows two US presidential candidates as they fight to win a place in the White House. But where does compromise end and corruption begin? As an ambitious newcomer and esteemed ex-Secretary of State battle head-to-head to reach their goal, their only to hope is to receive an endorsement from the current President and party big-wigs. Who will do it? West End veteran Martin Shaw stars opposite Jeff Fahey, with a stellar cast including Maureen Lipman, Jack Shepherd, Glynis Barber and Honeysuckle Weeks. At a time when American politics are fiercely debated, The Best Man should not be missed. After a hugely successful UK tour, the acclaimed production plays a strictly limited run at the London venue, with performances booking until May 2018. This production is recommended for ages 12+. Fantastic production with a superb cast! And in a beautiful historic theatre! What’s not to like! We went to see this show last night and it was utterly brilliant, probably one of the best west end shows we have ever seen. Set in the 1960's during the US elections it was a glorious evening spent watching an acting masterclass by the main players. The script was razor sharp and didn't let off for the entire show!. Martin Shaw, Jack Shepherd (Wycliffe) and the other leads gave first class performances and would personally give it 6 stars!. Jack's portrayal of the old president was simply amazing and he gave an Oscar winning performance, particularily working well with Martin. The show,(now extended)runs until the end of May and if you are in London do see it, you won't be disappointed. Brilliant! Superb! I can only describe this as a Master Class in how it's done! any person thinking of taking up a career in acting ( and a few established ones!) should visit this play in lessons in how to do it. No character can be singled out as each one understated to a fault. I had the pleasure of thanking Miss Lipman - what an actress - for a most enjoyable evening after the show. We sat with many people around us who also praised this performance as outstanding. Thank the Cast for a memorable evening. Saw the Saturday matinee and all the cast were outstanding. First non musical for me in the West End but despite seeing all the greats over the years this moved me like no other. Hats off to Martin Shaw who possesss real star quality but who the supporting cast are energised by and bring their A game to this intellectual study of American Politics that is as relevant now as it was when it was written. My wife and I went to see the show last night. It was great. The acting was amazing especially John Shepperd. Martin Shaw was also outstanding and I would highly recommend the show. Vidal Gore's theme applies to today's politics. Good cast.